In 1959, Jake Mullet begins building custom kitchen cabinetry, with no shop in which to work and very limited tools, in the heart of Ohio’s Amish Furniture Country. However, his dream is to someday have his own shop with modern tools (including sharp saw blades) instead of moving from job to job for his work. In June of 1965, Jake is offered a job in a small custom cabinet shop owned by Freeman Hostetler at the rate of $1.75 per hour. The business is located in a building rented from another Fryburg resident. Jake accepts the position and a special family legacy unfolds. Unfortunately, a paint room fire destroys the new facility in 1974. However, it is soon after this disaster that Freeman Hostetler offers Jake the opportunity to buy the business. Jake’s dream of owning his own custom cabinet shop finally becomes a reality. Together, in 1975, Jake and Dean purchase Hostetler Cabinet. A year later, Jake’s younger son, Dennis, joins the business (now Mullet Cabinet) as a partner. In 1987, Mullet Cabinet is outsourcing all of its hardwood doors and drawer fronts. After becoming frustrated with extended schedules, founder Dean Mullet’s dream of owning his own door plant becomes a reality with the launch of Fryburg Door. Starting in a 4,500 square foot building on the Mullet Cabinet campus, three employees produce only doors and drawer fronts for the first three years. Over the next 30+ years, Mullet Cabinet grows rapidly, becoming a premier custom cabinet manufacturer. Strong emphasis is placed on using cutting-edge technology in the shop, while at the same time offering innovative design, high quality custom product lines, and outstanding service to their customers – all at fair prices and while maintaining the highest levels of integrity. Noticing a demand in the market in 1999, a new line of frameless, commercial cabinets is created under the name Eurocase Architectural Cabinets and Millwork. Eurocase supplies quality commercial cabinets based on the 32mm system to the medical, educational, and commercial business markets. In 2001, Mullet Cabinet expands by selling to kitchen dealers east of the Mississippi. The partnership between father and sons continues under the business principles established by Jake until January of 2002, when Dean becomes the sole owner of Mullet Cabinet. Continuing with family tradition, Dean’s sons, Vince and Nick, become actively involved in learning the business and running the company. And in 2005, Vince and Nick become owners and actively run the company. Though, not actively involved in the business, Jake still occasionally stops to visit. 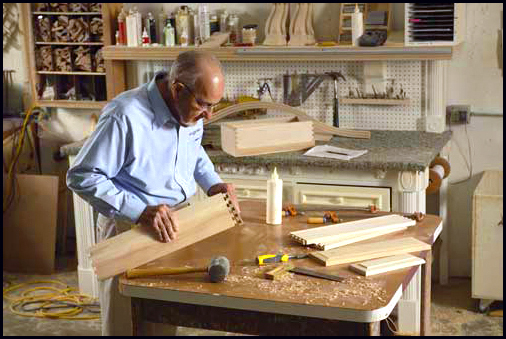 In 2011, Levant Kitchen Furniture is chosen as the kitchen cabinetry for the PBS series, This Old House – Bedford Project. After a successful six month test, a new frameless cabinet box is launched for Levant Kitchen Furniture. The new cabinet box is available with all of Levant’s fabulous finishes. In the factory, new equipment is added, including a new CNC and a flat line oven system. The state of the art finish department is expanded by 60% to allow for future growth. In 2015, we celebrate the milestone of 40 years building hand-crafted custom cabinetry AND the fulfillment of Jake Mullet’s dream to have his own shop with modern tools. Significant building changes include the 12 additions made to the original building between 1976 and 1998. Improvements are made to materials, methods, and equipment. (And, Jake finally gets his sharp saw blades!) Mullet Cabinet now includes a facility of approximately 75,000 square feet with over 100 employees – some of whom have been with the Mullet family for many years. Despite many changes and much growth since 1959, Jake Mullet’s original integrity and craftsmanship are still trademarks of Mullet Cabinet. Fryburg Door has a state of the art facility several miles down the road with 100,000 square feet of space. Fryburg Door supplies quality doors, drawer fronts, moldings, edge-glued panels, and cabinet components to cabinet and furniture manufacturers. In the spirit and precedent set by Dean, we look to the future with excitement and anticipation to realize new dreams. With gratitude, we celebrate those from our past who significantly impacted our lives and business. We also celebrate those in the present, who impact us daily with skills, stories, and smiles. Each contribution is sincerely appreciated. Guided by our heritage as a faith-based family business, we continually dedicate ourselves to provide premier experiences for our customers, team members, and community & honoring God. With anticipation, we thank you for allowing us to passionately inspire and influence the timeless beauty and craftsmanship of custom cabinetry into the next generation.